This week has been a bit hectic (AGAIN!) and I anticipate it to be that way until the end of this month. I am working like crazy on some volunteer projects that will all be coming to an end with a trip to San Francisco in a few short weeks! Until then, I have been devoting a lot of my spare time to all these last minute details and my blogging and reading are going by the wayside. Not surprisingly, my sleep is too! I really do believe that the less I read, the less I sleep . . . maybe it has to do with stress levels, but I really don't know. Therefore, I am going to start to resolve that this evening! I am going to finish writing this post and then I am going to go and read the rest of the night. I really don't have the time to do it, but I'm going to do it anyway!!!! Let's first start with the weekly overview of what I did get posted this week . . . I actually have another series post in the works with a GREAT list of recommendations, but I have not had the chance to finish it yet. I am hoping to finalize that one later this week. I have received so many recommendations and it has not been good on my TBR . . . and I think you are going to agree!! 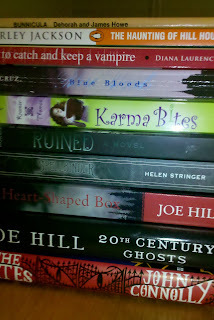 My priority books from the piles include The Heart-Shaped Box by Joe Hill and The Familiars by Adam Jay Epstein and Andrew Jacobson (which I just bought last night!). Other books that I really want to get to include Bunnicula by James Howe (a great one to re-visit after so many years! 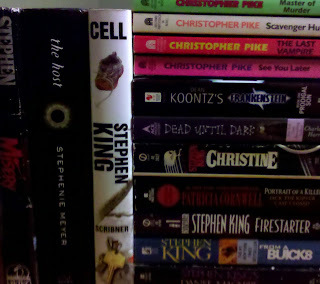 ), Karma Bites by Stacy Kramer and Valerie Thomas, and maybe a good ol' Stephen King! Of course, there is also the classic, The Haunting of Hill House by Shirley Jackson, too. Basically, I want to get to all of them, but we will have to see how far I get. The one thing that I have going for me . . . traveling!! Time in an airport and on a plane always translates to good reading time for me!! Last, but not least, I thought I would post the latest in my challenges!! I don't think I did very well this last month, but I'm really hoping to make up a lot over the next few months!! In fact, as of today, I think I have only completed one book since the last time I posted!!! So, so very, very sad! Okay, it is now time to go!! I actually set myself a timer and it is telling me it is almost time to go read!! Any great news or happenings within your pages this week? I agree that things have been hectic for me as well. 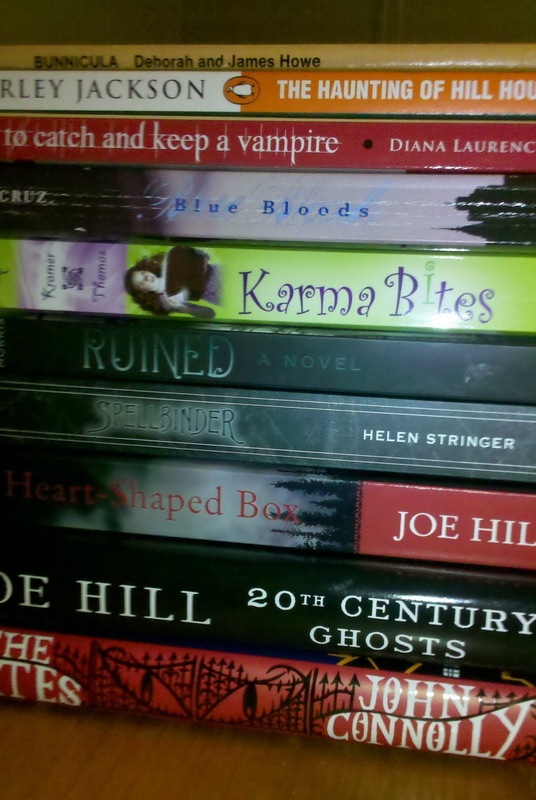 I love your book pictures, I see a bunch of titles from my TBR list on your shelves! 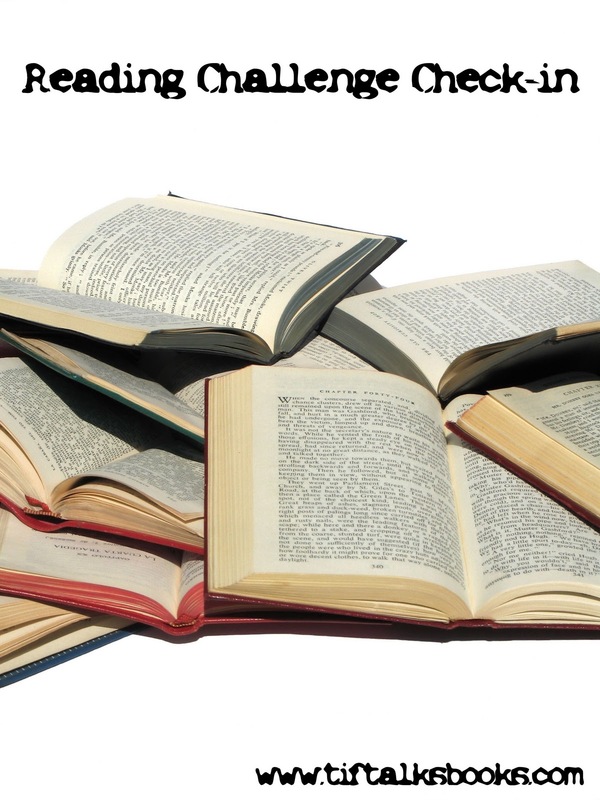 I love your piles of books! 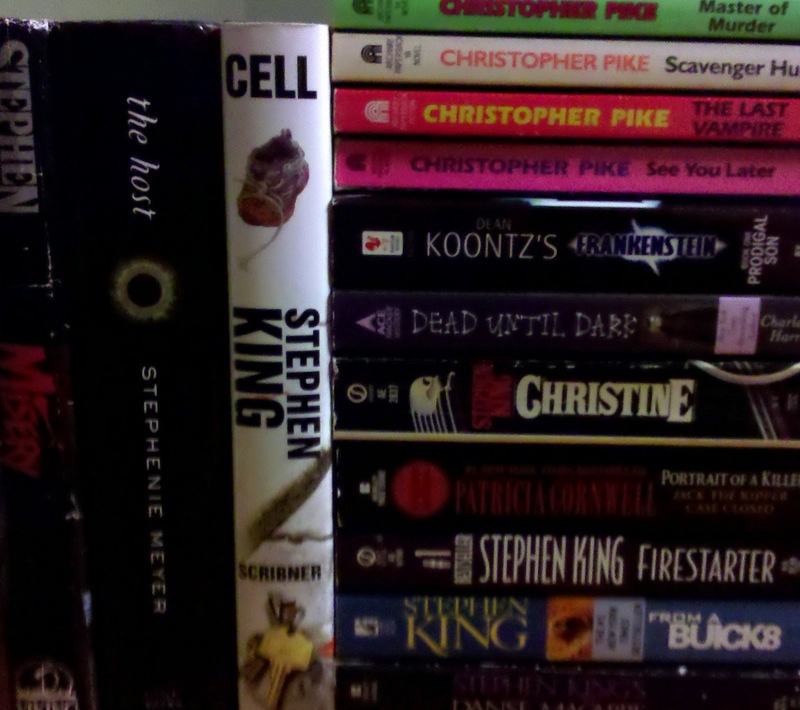 I've read a lot of them, being a huge Christopher Pike, Stephen King, and now Joe Hill fan. I just rented Horns so I hope to start it soon. It's a bit long for the readathon, but 20th Century Ghosts would be a good choice for you! I tend to read horror in October too, I'm reading my very first Bentley Little book now, and I'm liking it. I don't blame you for unofficially doing the challenge, I tend to do the same thing, because if I start out on a challenge I usually don't follow through. Holy Smokes, Batman, you have a lot of books! It hit me reading this why I never signed up for this challenge. During this time of year, I go through a reading slump. I'm getting back into read-alongs. It helped me last year. I'm still so impressed that you can keep so many challenges straight! And I think I spotted Ruined by Paula Morris in your pile, too. Pretty good book and I liked the New Orleans setting, looking forward to hearing what you think (if it is the right book...) since not many people I know have read it! Jill . . . Really?!? What are some examples? Maybe we can do some reading together?!? Kate . . . I don't know if I know Bentley Little. I need to check this out!! I used to LOVE Pike, but in college I sold all my books so that I could have some cash for more. I'm regretting it now and trying to get back all of what I used to have! J. Kaye . 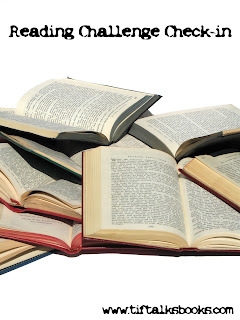 . . What read-alongs are you doing? I'm having my moments, but I really think that a lot of my slump has to do with other projects on my plate right now. Almost there!! lisa :) . . . I may be able to keep them straight, but I'm not very good at completing them apparently!! LOL!! :) I did know that Hill was King's son!! That was a surprise and I knew that I had to check out his books after I found out!! I do have Ruined in my pile and have heard some good things! Can't wait to get to that one too, especially considering that I was just in New Orleans last year!! 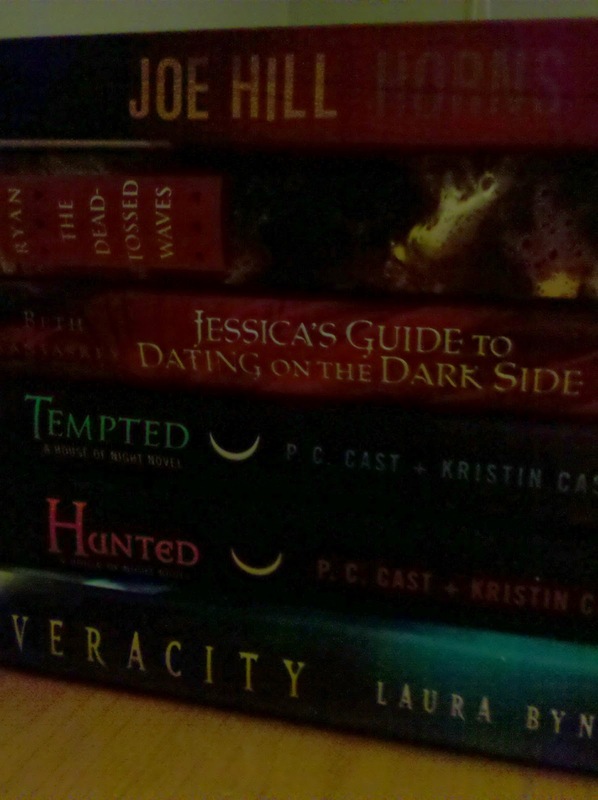 Of course, if you wanna have a read-along with Jessica's Guide to Dating on the Dark Side, I'll try to find a copy at the library. I've been wanting to read that one. J. Kaye . . . I am definitely interested in The Iron King!!!! I've had my eye on that one and I could see if I could get it from the library in time! Please let me know more info on that one!! I was out of town and then sick but I still wanted to comment on those books! I totally need to re-read Bunnicula so that I can figure out when Z will be ready for it. I must have read that one half a dozen times when I was a kid! Loved Spellbinder and The Gates so I can definitely recommend both of those. I hope that you have some good airplane reading time. I ended up being not in the mood on my flights which was a bummer. I just vegged and watched tv (thanks a bunch, JetBlue!). Kristen M. . . . Thanks for the recommendations!!! I cannot wait to get to some of these books! 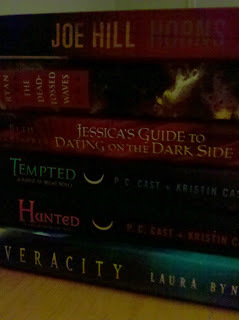 There are so many in these piles that I've been wanting to get to for far too long!! And, I was thinking of doing the exact same thing for my son!!! Maybe we can collaborate since they are about the same age?!? Here's hoping I get lots of reading time next week on the plane!! For some reason I just remembered that you said you were going to try and read The Haunting of Hill House last year, so i can and searched the title and this is the last post you mentioned it in. So I guess you haven't read it yet, but I'm really looking forward to your review when you do. Ryan G. ... I am sooooo sorry for replying so late! I got so crazy busy with Armchair BEA that I am just now catching up (finally)! I didn't get around to reading it last October, but I've still got it and plan to read it in the near future. I may save it for October, but haven't decided yet. What do you think?